The Maryland Area Regional Commuter (MARC) train service is the fastest commuter railroad in the country, routinely reaching speeds of 125 mph on the Penn line on the Northeast Corridor. 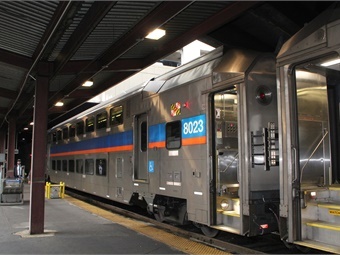 The MARC rail system, whose service areas include Baltimore, Washington, D.C., and surrounding areas, as well as Martinsburg, W. Va., operates on the Penn, Camden and Brunswick lines, with an average of 36,000 daily trips. It is run by the Maryland Transit Administration (MTA), a division of the Maryland Department of Transportation and one of the largest multimodal transit systems in the U.S. Additionally, the MTA operates local and commuter buses, light rail, Metro subway and a comprehensive paratransit system. MTA also manages the Taxi Access system and directs funding and statewide assistance to locally operated transit systems in each of Maryland’s 23 counties, Baltimore City, Annapolis and Ocean City. In December 2013, MARC also started offering weekend service on the Penn line, which has been a success, Kolig says. 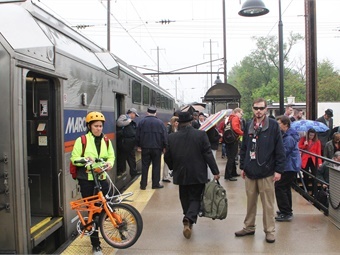 The following year, MARC expanded weekend service to include bike cars to allow passengers to bring their full-size bikes on board. “We’re transitioning from the idea of ‘you’re riding our trains’ to a ‘we’re providing your trains’ mindset in responding to our ridership’s needs and wants,” he says of the service initiatives. Another way the MTA is working to meet the needs of its riders is through MARC’s Riders Advisory Council, which is made up of upper management and representatives from MARC’s service providers, Bombardier and Amtrak. Also, an estimated 20 passengers, riding each of the three MARC lines from varying points, were selected to be representatives on the council, Kolig explains. These meetings allow passengers to interface with MARC management and to review service statistics like on-time performance, incidents that delayed service and new MARC initiatives. “This is a great forum for management to see what the riders are seeing,” Kolig says. Issues brought up during the meetings may lead to targeted solutions like better quiet car signage, new policies concerning crew conduct, etc. 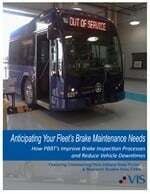 The council is also used as a sounding board for new initiatives or schedule changes proposed by the MTA and MARC. “It’s a good way to get cross-sectional feedback,” he adds. MTA will be launching a mobile ticketing application for MARC rail and commuter bus passengers next year. This will allow riders to purchase tickets from their phones and then present the phone for ticket validation onboard the trains. MARC also has a number of capital programs out to modernize its locomotives and the passenger railcars. The service is overhauling its 15-year-old Kawasaki cars and its older GP39 engines. The MTA is buying eight new EPA Tier IV 125-mph-capable diesel locomotives and MARC just completed the purchase of 54 new multi-level cars built by Bombardier. These cars allowed the retirement of 50-year-old gallery cars, Kolig explains. Additionally, the purchase expanded the fleet to allow for older single-level cars to be renovated into the bike-car fleet. The new cars also allowed the replacement of single-level cars in certain consists with these multi-levels. According to Kolig, the bike-car conversions have offered a great upgrade to service. Passengers may bring their bikes on board the specially appointed weekend trains for no additional charge. “There’s enough seating that you can sit on the same car right next to your bike and enjoy the ride between the bike-friendly cities of Washington D.C. and Baltimore,” Kolig says. In May 2015, Comfort was named the Administrator/CEO of the Maryland Department of Transportation’s Maryland Transit Administration (MTA). Prior to that, he served for five years as the director of operations/assistant project manager at the Washington Metropolitan Area Transit Authority’s MetroAccess Service for MV Transportation. 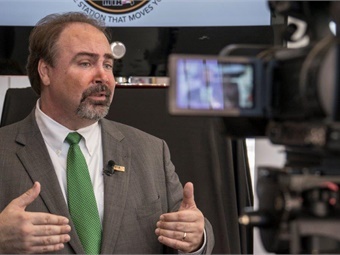 He has also served as the county administrator for two suburban Maryland Counties, Charles and Queen Anne’s, overseeing all operations for these local governments. Since he joined the MTA, Comfort’s focus on data-driven management resulted in an increase of more than 10% in the on-time performance rate for MTA local bus service. He also engaged private-sector partners to help deliver creative solutions for customers, including publicly releasing MTA’s General Transit Feed Specification data to facilitate development of a real-time bus and rail smartphone app. And, in October 2015, Comfort announced the BaltimoreLink transit plan, a restructuring of the MTA’s bus network that will improve connectivity and frequency. Growing up, I had three great, and very different, passions that consumed my time. My first was music. I played keyboard and sang in a band. The second was working in the news media industry. I worked for 16 years as a part-time host on a radio station on Maryland’s Eastern Shore. My third great passion in life is politics. I have held elected office and have been involved in bringing positive political change to my community for more than a decade. I feel so strongly about each of these passions I have developed, I believe that any of them could have provided me a viable career path. What past experiences/positions do you draw from to help you do your job? I served six years as a County Administrator, which required leading large, multi-faceted, government agencies. During my last five years of employment, I have worked for a private-sector transit management company overseeing paratransit operations. Those experiences have put me in a great position to run the MTA. I want the MTA to have the “head of the private sector” utilizing best practices and striving to innovate, but the “heart of the public sector” having as our primary goal to help people’s lives with outstanding transit service. What is your greatest daily challenge? Handling the myriad of pressured-decision points involved in rebooting and rebranding our primary transit services, while at the same time, overseeing the building of the nation’s largest current P3 light rail project, “The Purple Line” in the Washington D.C. suburbs. If you weren’t in public transit…? I would likely be involved in politics on a full-time basis. In that position, I could continue to really make a difference in people’s lives for the better. I enjoy spending time with my family and friends, reading good books, as I am a fan of non-fiction writing, riding my bike and attending local sporting events, such as Baltimore Orioles baseball games and Baltimore Ravens football games. with an average of 36,000 daily trips. 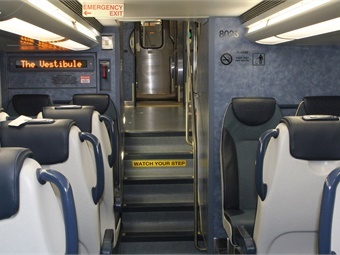 The aforementioned Bombardier multi-level vehicles, which went into service in 2015, feature upper and lower seating levels as well as a spacious intermediate level at each end of the car. Each coach has 15% to 30% more seating capacity than a typical single-level car. The low-profile vehicle is specially designed to meet the infrastructure constraints of certain rail networks, such as those posed by legacy tunnels, according to Maryanne Roberts, Bombardier’s U.S. head of communications/public relations. The two-by-two seating configuration eliminates the middle seat found on many single-level vehicles. Additionally, large side doors located at the intermediate level provide accessibility from both high- and low-level platforms and wider aisles facilitate passenger boarding and alighting. The multi-level vehicles also offer state-of-the-art technical features including an automatic public address system, LED destination screens, external public address speakers to keep passengers informed, whether on the train or on the platform; an advanced heating, ventilation and air conditioning system; microprocessor-controlled door systems; and a monitoring system that diagnoses and displays the status of all major train systems. In addition to supplying new railcars and overhauling other portions of MARC’s fleet, Bombardier also took over operation and maintenance of the commuter service in July 2013. MARC is a tenant railroad as it doesn’t own the tracks it operates over, Kolig explains. The MTA has operating access agreements with Amtrak, which owns and operates MARC’s Penn line and CSX Transportation, which owns the Camden and Brunswick lines. MTA’s new Bombardier multi-level railcars feature LED destination screens, external public address speakers and a monitoring system that diagnoses all major train systems. After three decades of service, CSX decided to focus on its core business, freight, and end its involvement in passenger rail operations, Kolig says. The contract with Bombardier provides for both the operation and service, and maintenance of equipment, facilities and rights-of-way used in providing service along the Camden and Brunswick lines.